After buying pretty Tiger Loaches some time ago, i didn't even think that it could be something other than S. hymenophysa - here in Poland availabiliy of loaches is really poor, and buying hymenophysas is such a success. But. My tigers don't really looks like a typical hymenophysa. Their colour is definitely darker and green stripes are at least two times wider than the brighter ones (hymenophysa has stripes like 1:1). Just look at those wide dark stripes! It's really hard to take a good photo of them. The reddish colour of fins is now weaker, but it's still visible. They have about 11-12 stripes - less than typical hymenophysa. 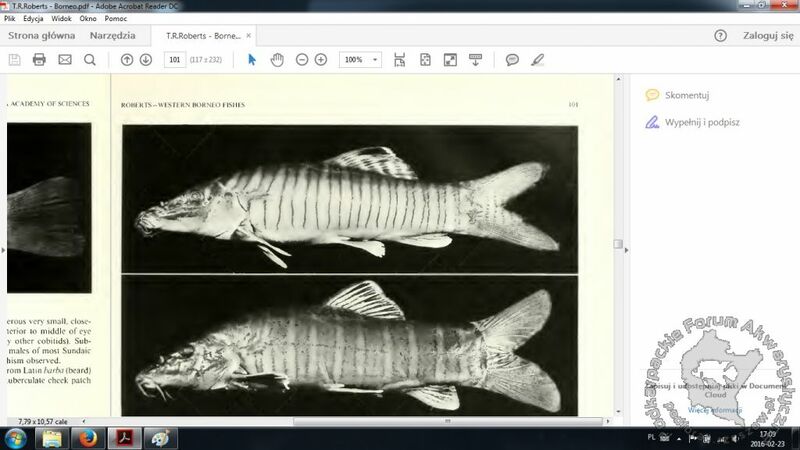 After reading Tyson Roberts' article about fishes from western Borneo (1989) - with reversa described for the first time, i'm more and more convinced that my specimens are actually S. reversa! In this article he points out that hymenophysa has very dark margins of the pale stripes - mine doesn't have stripes like that. He also writes about pale stripes on a darker background (hymenophysa), and dark bands on a wider body. Just like mine! And hymenophysa has definitely larger eyes - eyes of mine are really tiny. Очень похоже, что у вас действительно Syncrossus reversa. На фото правда не так хорошо видно, но отличия от hymenophysa есть. Вообще хорошо, если бы это были не hymenophysa. По опыту форумчан -у этого вида самый сложный характер из всех Syncrossus. Часто содержание их кончается тем, что они начинают проявлять агрессию к другим рыбам и своим собратьям. Даже при содержании группой. It seems that you really Syncrossus reversa. The photo really is not so good to see, but there are differences from hymenophysa. Generally good if it were not hymenophysa. In the experience of members of the forum of this type of y is the complex nature of all Syncrossus. Often the content of their ends so that they begin to show aggression to other fish and their brethren. Even when the content of the group. А у вас с кем они в аквариуме живут, кто в соседях? And you with whom they live in the aquarium, Who in neighbors? I keep them with clowns and with those "Udos" that I posted in another topic. The aquarium is 180x55cm and those tigers are not bigger than 10cm now - You see how slowly they are growing (my photos are from 2013 - they had 5cm these days). I've got only 3 specimens - in the pet store there were only 4 and as I wrote - one of them died (but it was "clear" hymenophysa). Despite of that I don't see any agression as sometimes people say: "oooh, my tigers are killing other fish! " Nothing like that. Of course they sometimes threaten other botias, but it's just a typical "botia playing" Nobody's hurt. I have to add that clowns are not bigger than tigers (some of them are very small), and "Udos" are so tiny. Good idea to write both in english and russian! Everybody will understand it now. I've got only 3 specimens - in the pet store there were only 4 and as I wrote - one of them died (but it was "clear" hymenophysa). Despite of that I don't see any agression as sometimes people say: "oooh, my tigers are killing other fish! " Nothing like that. Of course they sometimes threaten other botias, but it's just a typical "botia playing"Nobody's hurt. У меня только три образцы - в зоомагазине было только 4 и, как я уже писал - один из них погиб (но это было "ясно" hymenophysa). Несмотря на это, я не вижу никаких агрессию как иногда люди говорят: "ооо, мои тигры убивают других рыб улыбка: помощь:" улыбка: D Ничего подобного. Конечно, они иногда угрожать другим botias, но это всего лишь типичный "Botia играет" улыбка Никто не пострадал. Это хорошо. Еще одно, хоть и косвенное, докозательство, что они не hymenophysa. It's good. One more, though and indirect, evidence that they are not hymenophysa. Good idea to write both in english and russian!Everybody will understand it now. Хорошая идея, чтобы написать на английском и русском! улыбка Все поймут это сейчас. Это спасибо mikev за идею. Я еще буду давать и перевод вашего текста. Правда с помощью Гугла, чтобы получилось быстрее. Mikev Thanks for the idea. Thank you: I will else give and transfer your text. The truth with the help of Google, to get faster. as sometimes people say: "oooh, my tigers are killing other fish! Это реальные ситуации, очень жаль бывает, когда приходится расставаться с тигровыми боциями из-за такого поведения. А такие случаи на форуме были. This is the real situation. It is very sad when we have to part with tiger botia because of this behavior. And such cases on the forum was. This is the real situation. It is very sad when we have to part with tiger botia because of this behavior. smile:Плачь: And such cases on the forum was. Hmm, I'm not pretty sure that it is the evidence. This one hymenophysa I had previously, was behaving the same as them. It wasn't aggresive. 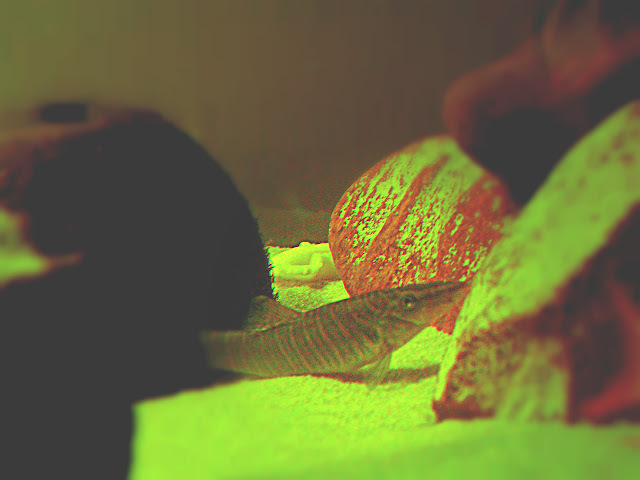 And generally botias are more aggresive when their shoal is small. I've got only three of them so they should be terroristic But they are not. And what's more: IMHO the most important thing is the good choice of their neighbours. Keeping them with for example cichlids will provide to a war. Also some small tetras or loaches like pangios or homaloptera will probably be killed by tigers. They are not compatibile. But I think that botsiyah are very intelligent fishes, so they know how to live together harmoniously. They just understand the hierarchy. So that's why my tiny botsiyah are not afraid of tigers. Generally IMHO the best neighbours for tigers are of course botsiyah, large barbs, other fast swimming cyprinids, fishes like labeo. Strong or fast. More delicate fishes are not compatible and they really can be hurt by tigers. Хм, я не уверен, что это свидетельствует. Этот hymenophysa я был ранее, вел себя так же, как и они. Это было не агрессивны. И вообще botias более агрессивный, когда их мелководье мала. У меня только три из них поэтому они должны быть террористическим улыбка Но это не так. И более того: ИМХО самое главное это хороший выбор своих соседей. Держать их с Например цихлиды обеспечит войны. Кроме того, некоторые небольшие тетр или гольцов как pangios или homaloptera, вероятно, будет убит тигров. Они не совместим. Но думаю, что боции очень умные рыбы, так что они знают, как жить вместе гармонично. Они просто понять иерархию. Так вот почему моя крошечные боции не боятся тигров. Вообще ИМХО лучшие соседи для тигров, конечно боции, крупные барбусы, другие карповые быстро плавающие рыбы, как лабео. Сильный или быстроплавающие. Более нежные рыбы не совместимы, и они действительно могут пострадать от тигров. Перевод поста здесь дам, возможно у кого-то будут комментарии. С последним предложением согласна полностью. Правильное расположение укрытий очень важно. Translation post here will give, perhaps someone will comment. But with the last sentence agree completely. The correct location of shelters is very important.